Jan Huisken and his research team (MPI, Dresden) took advantage of the light sheet microscopy approach of SPIM and the fast acquisition speed of the sCMOS camera to study the endoderm of the Zebrafish during early stages of development. Light sheet microscopy, such as SPIM has been shown to be a valuable technology that performs especially well in samples that are too large for conventional microscopy, such as confocal. In SPIM, instantaneous optical sectioning is achieved by illuminating the sample with a sheet of light and generating fluorescence in a thin slice, which is then imaged with a fast and high resolution sCMOS camera. Utilising the sCMOS camera in SPIM generates approximately three orders of magnitude more data than a confocal microscope and therefore can present a major burden of data transfer, storage and management. Huisken and his team realised that compression of data and ‘on-the-fly’ processing was required to make this technique a success. Figure 1. Four-lens SPIM setup and image acquisition. Their research focusses on the coordination of cells in space and time that patterns the endorderm during the early stages of Zebrafish development. Early endoderm migration is of immense importance for organ formation, as defects in cell movement during gastrulation result in the duplication or mis-positioning of organs. 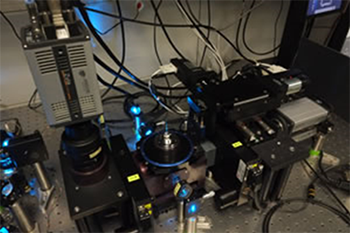 Huisken and his team built a four-lens SPIM system (Fig 1) with integrated real-time image processing that delivers multiple views at high speed and is optimized for capturing the entire Zebrafish endoderm. The central unit of their setup consists of four identical objective lenses. The two detection lenses and their associated optics image the common focal plane onto two sCMOS cameras. A linear stage moves the sample along the detection axis through the focal plane, triggering the acquisition of the cameras every two microns. The two illumination lenses alternately illuminate the focal plane with laser light at every position during the scan. The cameras capture an image of the entire field of view ~1.2 mm at 62.5 fps. Zebrafish embryos (5h post fertilization) were embedded in 1.5% low-melting agarose in a fluorinated ethylene propylene (FEP) tube. To enable visualization of the endoderm, the transgenic Zebrafish line Tg(sox17:EGFP), was used. The tube was mounted on the stage, dipping into the medium filled imaging chamber from the top. As the sample was moved through the light sheets, the cameras acquired the well resolved sectors of the embryo. This process took < 10s. Huisken found that by rotating the embryo by 45o at each time point to acquire a second, complementary view the image quality improved. Figure 2. Spatial orientation of a Tg(Sox17:EGFP) embryo in 3D and on the final map projection. The high resolution images of the entire endoderm were computed during the acquisition in real time. In their approach, a typical data set requires Gigabytes rather than Terabytes and offers visualization and evaluation of the cell migration in the context of entire embryos right out of the microscope. Taking insights from cartography they were capable of generating 2D map projections to visualize the entire embryo in a single image (Fig 2). In addition, real-time image registration eliminates any movement of the embryo in its chorion and registers all embryos to a common, predefined coordinate system. Zyla 5.5 and Zyla 4.2 are dieal detectors for high-speed light sheet microscopy. Both cameras offer a large field of view and high resolution without compromising read noise or frame rate, and the 6.5 μm pixel size is ideally suited to SPIM. The small pixel size of 6.5 micrometers ensures sufficient oversampling of the pointspread-function, even for objectives with low magnification (e.g. 10x NA 0.3; 20x NA 0.5). The read noise is very low, even when compared with the highest-performance slow readout CCDs. Zyla 5.5 can achieve a read noise down to 1.45 e– rms, while Zyla 4.2 has a read noise of 1.1 e- rms, both without signal amplification, while reading out 5.5 and 4.2 megapixels at 100 frames per second respectively.